Barbados Plays Like A Girl – Barbados Olympic Association Inc.
Bridgetown — The Barbados Olympic Association Inc.’s Women and Sport Commission recently hosted the ‘Play Like a Girl! 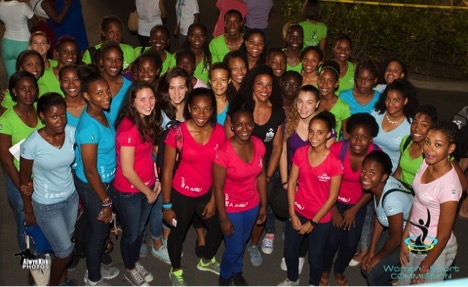 Women and Sport Athlete Workshop’ for young Barbadian girls in sport. Held over three sessions from Friday May 15 to Sunday May 17, the workshop was centred on the theme – ‘It’s not the Victory; it’s the Struggle’. It was designed as an opportunity to motivate and inspire Barbados’ future elite female athletes, all aged between 14 to 18 years. A potential candidate for a major games within the next quadrennial (Youth Olympic Games, Commonwealth Games, Youth Commonwealth Games, or Central American and Caribbean Games). Is on the national team or currently attending the national trials. Has consistent performance in the sporting discipline. Is viewed as a prospective young leader. Approximately 40 female athletes attended the hands-on workshop, which not only involved self-development activities like goal setting, but also interactive expert sessions, and even an Olympic Tour at the National Olympic Museum at the Barbados Olympic Centre. The purpose was to show young women that in fact the journey (or the ‘struggle’) is indeed the reward. There were also countless positive role models on hand to inspire the young girls to continue their paths to success. One of the most popular sessions of the weekend was the ‘talk back’ panel with some of Barbados’ most renowned athletes. Chelsea Tuach (local surfing champion), Anicia Wood and Rhe Ann Niles (former professional volleyball players), Shakera Reece (Barbadian sprinter) Soraya Toppin Herbert (football scholarship awardee), and Alex Jordan (Barbadian squash player and leading morning radio personality) all actively participated, just to name a few. Event coordinator, Sasha Sutherland, from the Women and Sport Commission, said the girls all gave very positive feedback and were enquiring about future events of that nature. She said that they all expressed the view that it was one of, if not the best workshop that they had ever attended.